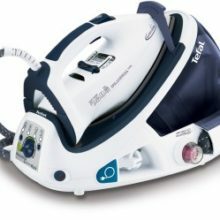 Another brand famous for its steam generator irons is the Tefal brand. They make a number of slightly different styles and have various models of irons available. We shall have a look at all of them here. In this article we include reviews of the best Tefal Steam Irons currently available on the UK market. 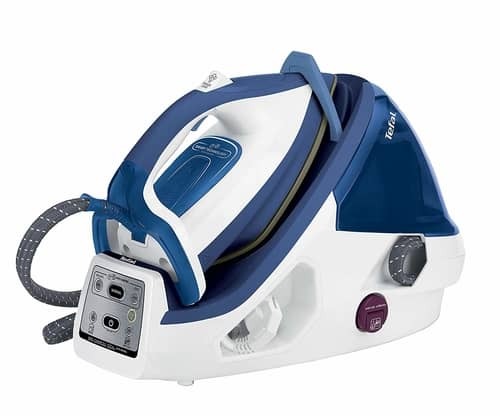 For each different steam iron model mentioned we have then done a more detailed review which you can check out by clicking on the link associated with it. Please note the price points we use are average prices as these change all the time. Usually if you search online, you can find cheaper prices than buying the iron in a Retail store. Just below you can view a short video on what a typical Tefal steam generator looks like and how to use it. If you click on any of the product links, you can read a short summary review of the iron. In that summary is a brief description and a link to a more detailed review. Below you will find a table of these irons, where we have included the model number, the price band, the average buyer satisfaction rating, the wattage of the iron, the bar pressure and the size of the tank. If you click on the model number that is a link where you can read a detailed review of each iron. Please note you can also sort the table by clicking on the column that interests you. 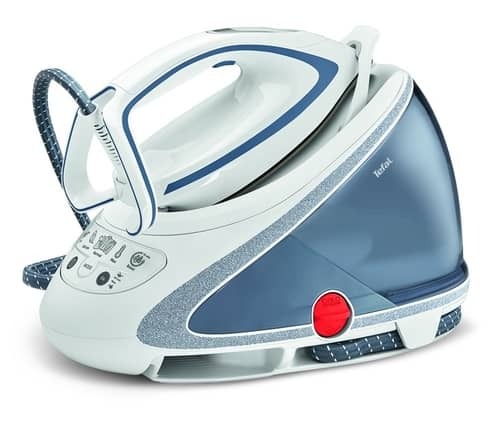 This is the highest rated Tefal steam generator to the UK market. It is very expensive but can be found online slightly cheaper if you are willing to shop around. This iron is packed with all the latest features, and that explains the higher price point. 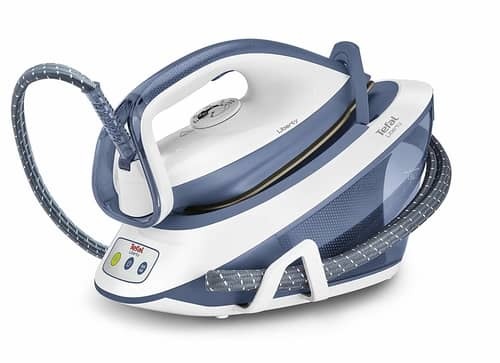 This iron has 6.5 Bars of pressure and has a 400 grams per minute shot of steam. It comes with 3 settings which are normal, delicate and jeans. It also has a 1.6 litre water tank and smart cord for easy storage. It also has a limescale collector. It measures 49 x 37 x 29.4 cm, weighs 5.86 kg and is powered by 2,400 watts. 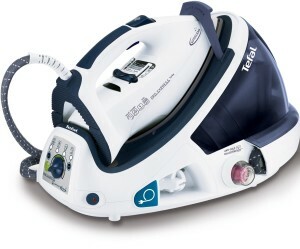 At number two on our list is the populat Tefal GV9563 model. This is at the higher end of the Tefal price range, but it does get very good buyer reviews. It can provide 7.5 bars of pressure with 140g/min continuous steam and 500g/min steam boost. This model also has an important protection system that prevents stains, by using a scale collector. This is a lightweight iron with an auto clean soleplate for superior glid​ing across the clothes. It has a large removable water tank and safety lock. This one is the best selling iron currently available in the UK market. It is one of the highest rated on the UK market as well, with consistent ratings of 90%. There are also several hundred reviews on this model from very satisfied buyers. With a huge 1.8 litre tank, it also has a very smooth sole plate which delivers a great ironing experience. This one truly ticks all the boxes. The big downside is that it has an average RRP of around £160. That clearly is not a cheap option. If you are willing to pay that though, you will own one of the best selling steam generating iron, currently available on the UK market. This is the popular and affordable GV8930 model. This model only takes a couple of minutes to heat up. It has variable steam of 120 grams per minute and a shot of steam of 310 grams per minute. It measures 48 x 36.9 x 28.8 cm, weighs 5.67 kg and has a very large 1.8 litre water tank. It is powered by 2,200 watts and also has a limescale prevention system. This one has an RRP of around £15o, but it is always possible to find a good deal online with a little shopping around. Overall buyers rate this one highly with an average online buyer rating of 86%. This is now classed as an older model, but buyers are still purchasing this one based on the quality and price. This GV9071 model normally retails at £329.99 but I have managed to find this one cheaper online. Don't be afraid to check out prices online as usually you can find some type of offer. 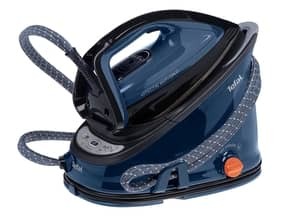 Like many in the Tefal range this one is an expensive option, but also a very good one. Overall buyers have given this one an average buyer satisfaction rating of 88%. It is available in a black/blue colour or in a striking red/white colour. This one has a 1.6 litre removable tank and a safety electric cord. It measures 49.5 x 36.8 x 29.5 cm, weighs 4.73 kg and is powered by 2,400 watts. From this information you can tell that this is one of the highest specification of irons currently available on the UK marketplace. 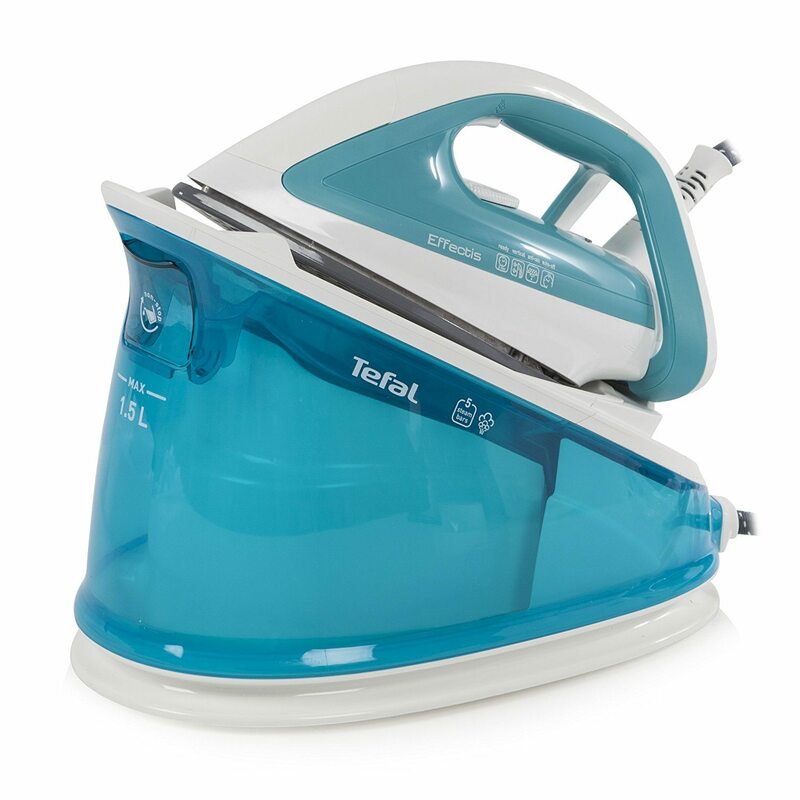 The GV8962 and forms part of the Tefal Pro Express range of irons. This iron has 3 settings, delicate, jeans and normal. It has a limescale collector and an auto-clean sole plate. It uses 6.5 bars of pressure for a lot of steam. It allows this iron to have a steam shot of 430 grams per minute. 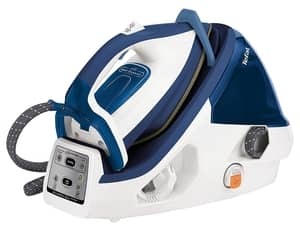 There are around 100 online buyer reviews who have rated this iron with an average buyer satisfaction rating of 84%, so again consistently high. It measures 49.4 x 37 x 28.8 cm, weighs 5.5 kg and is powered by 2,400 watts. The main reason for its popularity is that compared to many other Tefal irons, this model is at the lower end of their price point range. It is still not a cheap purchase though, however it does deliver very good quality, and of course a very good brand. Hundreds of online buyers have given this model an average buyer satisfaction rating of 80%. It only takes a couple of minutes for this one to heat up, and it then has a full 5 bars of pressure that can quickly generate a lot of steam quickly. This model also has a vertical steam option which is great for steam hanging garments. Overall buyers have rated this one with an average buyer satisfaction rating of 76%. On average this one costs in and around £150 depending on where you make your actual purchase. You can get this one in a black/blue colour or in a black/green colour. It heats up in 2 minutes, has 6.5 bars of pressure and a 300 grams per minute steam boost. This iron has a limescale collector and a 1.4 litre water tank. Overall buyers have rated this one with an average buyer satisfaction rating of 68%. On average this one costs under £95 depending on where you make your actual purchase. You can get this one in a white and light blue colour. It heats up in 2 minutes, has 5.4 bars of pressure and a 290 grams per minute steam boost. 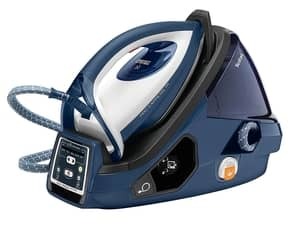 This iron has a limescale cartridge and a 1.5 litre water tank. Overall buyers have rated this one with an average buyer satisfaction rating of 74%. On average this one costs in and around £180-250 depending on where you make your actual purchase. You can get this one in a blue/white colour. It heats up in 2 minutes, has 6.5 bars of pressure and a 400 grams per minute steam boost. This iron has a limescale collector and a 1.6 litre water tank. Limescale is a huge problem in the UK. This is the scale that builds up in the bottom of kettle and irons. It is caused by the way water is treated and the quality of water varies quite a bit throughout the United Kingdom. Many areas in the UK have what is called "hard water." That needs to be treated, but in turn that can also cause a lot of limescale to be created. It can cause a lot of problems if not dealt with. Tefal have developed a good system and this brand will either use filters to help prevent problems, or collectors in the higher end irons.